Ministry of Truth II: Do I Have To Keep Telling You To Read 1984? In George Orwell’s 1984, Orwell’s governmental agencies are given ironic names, names that might have you think that they responsible for one thing, when in fact they do the opposite of what you would expect given the name – the very definition of irony. For example, the Ministry of Plenty is responsible for wartime rationing, which is to say, daily, weekly, monthly, yearly rationing because Oceania (the super state that is the setting of the novel) is in a state of perpetual war. Before I go any further, let me state the obvious. If you haven’t, yet, read 1984, now would be the time, if you can find a copy given its recent surge in popularity. I can’t tell you everything about the novel, but I will tell you this: dystopian novels like 1984 are satires, satirical works that employ heavy irony to make a point. Most dystopian novels are also cautionary tales – texts that attempt to warn us about abuses of power in hopes that we’ll do something about it before it’s too late. They are novels that look at history, to what has happened, to show us what is possible, and they look forward to a future, that the author fears, is possibly looming. Might our current administration want the American people to do just what Winston describes here, “to hold simultaneously two opinions which cancelled out, knowing them to be contradictory and believing in both of them, to use logic against logic,” and that Conway and Spicer are “conscious of complete truthfulness while telling carefully constructed lies.” Could the entire Trump administration be emboldened by the fact that most Americans cannot discern real news from fake news? It sure seems that way to me. And I’m not talking about the so-called legions of ‘un-educated’ folks who voted for Trump. In “Students Have ‘Dismaying’ Inability To Tell Fake News From Real, Study Finds,” a NPR article by Camila Domonoske, a Stanford study of nearly 8000 students in twelve different US states reveals that students in middle school, high school, and college (even Stanford students) had trouble discerning a fake website from a real one, fringe sources, or the difference between a sponsored and non-sponsored site. Kellyanne Conway and Sean Spicer are betting on the very real possibility that most Americans adults are as easily duped. 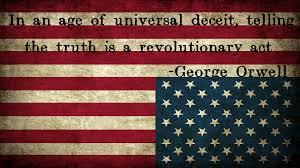 * Orwell, George. 1984. Signet Classic. New York. 1950. Print.